Candy's Music Shop is a building owned and maintained by Candy Kong in Donkey Kong 64. It is featured in every world except for Jungle Japes, Fungi Forest and Hideout Helm. In this store, the Kongs can each purchase their own instrument and upgrades for them. There are two instances where Candy adds an extra Watermelon to their life bar. After purchasing their instrument, the active Kong can have Candy replenish their instrument's energy, but this is also doable with Headphones. Each Kong can purchase their instrument for three Banana Coins. By default, their instrument can be used up to ten times without a Music Pad. After the first Kong purchases their instrument, Candy increases every Kong's life bar capacity to two Watermelons. Starting with Gloomy Galleon, the Kongs can perform up to 15 times if they pay five Banana Coins. Starting with Crystal Caves, the Kongs can perform up to 20 times if they pay seven Banana Coins. Candy also adds a third Watermelon to the Kongs' health bar. Starting with Creepy Castle, the Kongs can perform up to 25 times if they pay nine Banana Coins. The instruments from the Banjo-Kazooie intro. 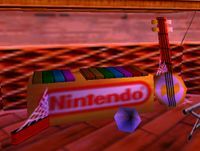 The instruments from the opening of Banjo-Kazooie, including the xylophone, kazoo, and banjo, appear in the background of Candy's Music Shop, and are covered in cobwebs. In Gloomy Galleon, during a cutscene where the pirate Seal is freed after Donkey Kong's Baboon Blast challenge, Candy's Music Shop appears but then disappears in the next few seconds before the cutscene fades out. 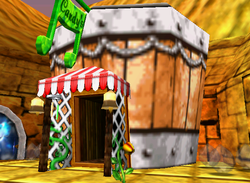 Additionally, the rear view of Candy's Music Shop is only seen in Gloomy Galleon, where it is located on a floating broken piece of a shipwreck. Candy's Music Store is twice its usual size in Creepy Castle, therefore making it impossible for the Kongs to reach the awning above the entrance and the roof. This page was last edited on December 4, 2018, at 17:40.